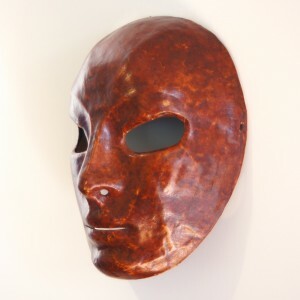 Russell’s studies, research and experience convince him that masks are a unique set of tools – they construct the bridge between primitive societies and our own modern civilisation. In the hands of an experienced guide, they can return to us what has been lost over centuries – access to the unconscious – our own visceral, primitive, ‘knowing’ energies – our intuition – of which the modern world has robbed us. They connect the primitive ‘mind’ with the modern, thus making us more whole, more in tune with ourselves. 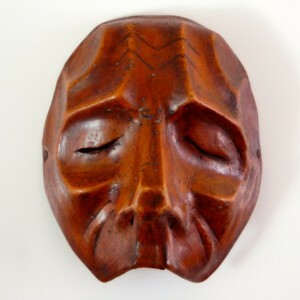 Primitive societies did, (and still do…) use masks in ritualised activity, to give the wearer certain powers – to transform and render them into a ‘being’ of greater dimension than the quotidian ‘human being’. We so often consider the locus of ourselves and our consciousness to be our minds, our brains, our ‘head-space’. Not true at all. The Neutral mask, in particular, helps us access corporeal wisdom – the ‘blind’ brain which stretches the length of our electric spine, and spreads it’s delicate tendrils to our extremities. Work with the mask will enhance your presence – both before an audience and in your own space. What does it mean to be a physical being commanding a space shared by others? How do we enable this state – how do we generate focus, how hold attention, how find natural rhythms and timing? How do we find EASE. In practice, the mask works towards integrating thought and body-process – so that a thought can originate simultaneously in body and mind. There is no past, no future for the mask – only the present. And YOU are THERE…. PRESENT… all facets of your being, energies funnelled and focussed. We experience that moment to its fullest, and only then, move on. 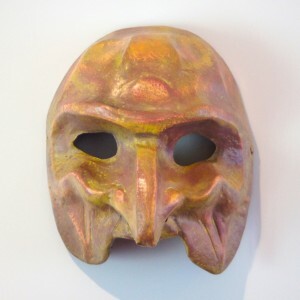 The sole qualities which the mask broadcasts are what the wearer brings to it – with his or her: Eyes, limbs, torso, movement, rhythms, relationships, choices. Our life’s path – We definitely start from A…. eventually… we end up, at B. Our journey in the Mask is a microcosm of our greater journey – en route in both there are discoveries, surprises, moments to be marked, decisions to be taken. Each journey has its own rhythm and its time. We gradually attune ourselves to these. The human being is more powerful when it is not identified personally – (hence the mask is a ‘Human Face’, not a ‘Person’s Face’.) The mask leads us out of our own “small, or daily” persona, in order to expand, to claim our OWN space in the universe, within reach of the elemental, unconscious power, the source of all life. For our own identity, or persona, to be carried on by the universe means little – but the identity of humans as a species IS important – for the progression of the human race, intelligent life, for the universe to perceive itself. Those of the imagination, of the physical being… of the expanding, infinite reaches of the quiet mind.